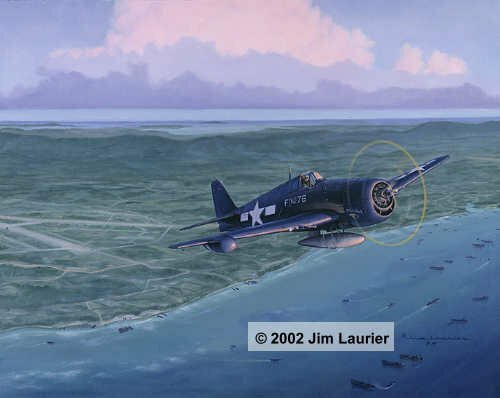 Maj. R. Bruce Porter flew Grumman F6F-5N Hellcat night fighters in Squadron VMF-542N during the Battle of Okinawa. Equipped with a radome on the starboard wing, these Hellcats prowled the night sky searching for Japanese aircraft that were sent out to destroy American ships, airfields, and other installations. On the ground, U.S. radar stations would identify targets on the screen and vector the Hellcats towards them. The Hellcat's airborne radar was only really effective when they were within a couple miles of the target, so the ground radar controller would stay in communication with the Hellcats until the pilots were close enough to visually identify the Japanese aircraft. Usually, the exhaust flame from the Japanese plane would give them away and the Hellcat would move in extremely close and, still undetected, deliver a fatal burst of 20mm cannon fire. It took incredible flying skill and nerve to fly a night fighter, and only the very best pilots were selected to do this job. Maj. Porter scored a very rare double night kill on one mission and became an ace. He is depicted climbing out of Yontan airfield on Okinawa for one of his night missions.